These systems can be installed as both front facing or rear-facing cameras. Motorcyclists beware: you are no longer immune to capture. 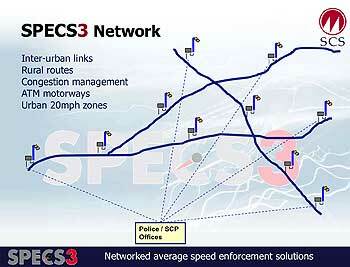 This article explains what SPECS3 is contrasting it to the Current SPECS1, and we also have a video of the SPECS3 presentation made by SCS Marketing Director Geoff Collins explaining the average speed camera systems. The current SPECS1 system can only measure your average speed across a measured stretch of road. It has one entry camera and one exit camera. Using an established ANPR (Automatic Number Plate Reader) system a car entering the monitored stretch of road has it's number plate read and an entry time recorded. When the car goes through the exit speed camera site it's plate and time are recorded. The backend system can then calculate the time between the two points, and then as the distance is a precise measurement the average speed of the car can be determined. If it is over the speed threshold for that section then a ticket will be issued. There are a number of drawbacks to this system. The first of which is that they need to be directly connected to each other, this may not be a problem for a modern road equipped with fibre-optic cabling, but means laying expensive cables where there are no current facilities. There is also a problem in that the cameras are forward facing so unlike the Gatsos will only capture number plates of cars and lorries. With SPECS1 motorcyclists are immune from prosecution as the system simply cannot identify them. So the new SPECS3 system addresses these points and offers a significant enhancement to the functionality allowing more offences to be captured. The main difference is that speed cameras have evolved: First we had the single Gatso lying in wait to capture the errant driver, then the speed cameras stalked in pairs to catch your average speed, now with SPECS3 they hunt in packs over an entire area... The way this works is similar to the London Congestion Charge zone. All entry and exit points to a particular area will have a camera installed. These connect to the back-office enforcement system in a number of ways depending on the installation, including WiFi, ADSL, Fibre-optic, and even GPRS using cellular technology. The SPECS3 average speed camera system is currently going through Home Office Type Approval and with a number of systems on order we should see them being installed in the near future. The SPECS3 system was launched at a conference hosted by Steven Norris (former Minister for Transport) at Traffex 2009 in Birmingham last month. 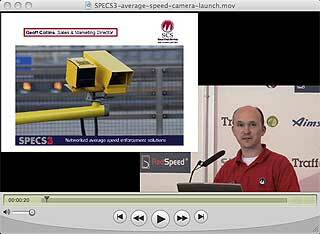 Click here to watch a video of the presentation by SCS Marketing Director Geoff Collins explaining the average speed camera systems. Should we just hand the keys to The Royal Mint to SCS and allow them to literally print money? I'm sure they'd love the cash but they get paid the hardware only, not the fines! True, but the more money the government raises through fines, the more cameras they'll buy to expand coverage and further increase revenue. I wouldn't be surprised if within the next 20 years our entire motorway and major A-road networks will be controlled with these. It's a wonder they trust us to drive our own cars at all. having said that, just stop for an extra 5 seconds at every junction and that'll soon get your average speed down if it has crept over a little! just stop for an extra 5 seconds at every junction and that'll soon get your average speed down if it has crept over a little! That rather defeats the object of hurrying in the first place - aren't you "creeping over a little" by trying to beat the five seconds? If the reports they claim of ticketing are anything like correct then the fines dont come anywhere near the cost of the installations and running costs. A77 Installation cost £300,000 4 tickets per week £240 (ignoring the management overhead) the cameras need to be in place for 22 years to even cover the installation costs let alone make money. A616 Installation cost £300,000 80 tickets per week. Installation will pay for itself in 63 weeks. That doesnt sound like coin it in... In fact SCS seem to get a pretty good deal from that. It makes sense then for other savings to be brought into the equation to justify the cost of these systems. Keep to the posted speed limits. Mike, I'm not arguing with the figures, but how can so many people be caught by the A616 cameras versus the A77 ones? If I remember correctly, the A616 ones have been in place a lot longer than the A77 ones, so must have paid for themselves already? I'd love to see the figures from the widening of the M74 at Gretna/Carlisle. Every time I went through many overtook me going sufficiently fast to be NIPped. I don't believe for one minute only 4 tickets are issued per week, or some 200 per annum. Where is the source? Remember, that in the 60MPH area, there aren't a lot of places to overtake, so the HGVs heading for the ferries pull down the average speed. I could really do with a good "average speed between Specs" calculator that would allow me to try to catch my average speed up, once I have a clear road ahead. I reckon this will see a new wave of number plate cloning, etc. once it becomes more wide spread, I wonder how they plan to combat that? "at night you can't see the colour but that doesn't matter"